Bosnia Herzegovina. (2008). In Philip's encyclopedia. [Online]. London: Philip's. Available from: https://search.credoreference.com/content/topic/bosnia_herzegovina [Accessed 26 April 2019]. "Bosnia-Herzegovina." Philip's Encyclopedia, Philip's, 1st edition, 2008. Credo Reference, https://search.credoreference.com/content/topic/bosnia_herzegovina. Accessed 26 Apr. 2019. Bosnia-Herzegovina is one of the five republics to emerge from the former Federal People's Republic of Yugoslavia. Much of the country is mountainous or hilly, with an arid limestone plateau in the SW. The River Sava, which forms most of the N border with Croatia, is a tributary of the River Danube. Because of the country's odd shape, the coastline is limited to a short stretch of 20km [13mi] on the Adriatic coast. The coast benefits from a Mediterranean climate. Summers are dry and sunny, while winters are moist and mild. Inland, the weather is more severe, with hot, dry summers and bitterly cold, snowy winters. The N experiences the most severe weather. Slavs settled in the region c.1,400 years ago. Bosnia was settled by Serbs in the 7th century and conquered by Ottoman Turks in 1463. It remained part of the Ottoman Empire until the 19th century. The persistence of serfdom into the 19th century led to a peasant revolt in 1875. In 1878, the Austro-Hungarian Empire gained temporary control over Bosnia-Herzegovina at the Congress of Berlin, and it formally took over the area in 1908. The assassination of Archduke Franz Ferdinand of Austria-Hungary in Sarajevo in June 1914 was the catalyst for the start of World War 1. In 1918, Bosnia-Herzegovina was annexed by Serbia as part of the Kingdom of the Serbs, Croats and Slovenes, renamed Yugoslavia in 1929. Germany occupied the region during World War 2, and Bosnia-Herzegovina came under a puppet regime in Croatia. A Communist government took over in Yugoslavia in 1945 and a new constitution in 1946 made the country a federal state, with Bosnia-Herzegovina as one of its six constituent republics. Under Communism, Bosnia-Herzegovina was a potentially explosive area due to its mix of Bosnian Muslims, Orthodox Christian Serbs and Roman Catholic Croats, as well as Albanian, gypsy and Ukrainian minorities. These ethnic and religious differences started to exert themselves after the death of Yugoslavia's president Josip Broz Tito in 1980, among increasing indications that Communist economic policies were not working. Free elections were held in 1990 and non-Communists won a majority, with a Muslim, Alija Izetbegović, as president. In 1991, Croatia and Slovenia declared themselves independent republics and seceded from Yugoslavia. 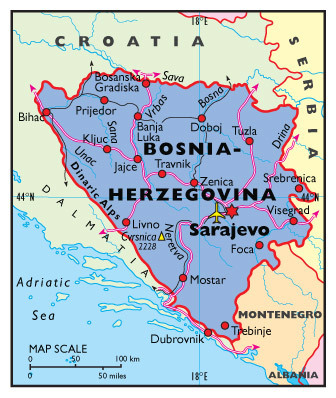 Bosnia-Herzegovina held a referendum on independence in 1992. Most Bosnian Serbs boycotted the vote, but the Muslims and Croats voted in favour and Bosnia-Herzegovina proclaimed its independence. War then broke out. At first, the Muslim-dominated government allied itself uneasily with the Croat minority, but it was at once under attack by local Serbs, supported by their co-nationals from beyond Bosnia-Herzegovina's borders. In their 'ethnic cleansing' campaign, heavily equipped Serb militias drove poorly-armed Muslims from towns they had long inhabited. By early 1993, the Muslims controlled less than a third of the former federal republic. Even the capital, Sarajevo, became disputed territory suffering constant shelling. The Muslim-Croat alliance rapidly disintegrated and refugees approached the million mark. Tougher economic sanctions on Serbia in April 1993 had little effect on the war in Bosnia. A small UN force attempted to deliver relief supplies to civilians and maintain 'safe' Muslim areas to no avail. In 1995, the warring parties agreed to a solution to the conflict, the Dayton Peace Accord - the dividing of the country into two self-governing provinces, one Bosnian Serb and the other Muslim-Croat, under a central, unified, multi-ethnic government. A NATO-led force helped stabilize the country. A European force took over in 2004, completed the task of stabilization, and will leave in 2007. The economy of Bosnia-Herzegovina was shattered by the war in the early 1990s. Manufactures include electrical equipment, machinery and transport equipment, and textiles. Farm products include fruits, maize, tobacco, vegetables and wheat, but the country has to import food.